This week let’s start with Holoride, because it’s VR in a moving car, and it sounds equal parts incredible and equal parts vomit inducing. Audi and Disney have teamed up to offer a unique experience, Disney offering up the VR headset with accompanying Marvel content, while Audi provide the car, because that’s what they do. The two together provide a marriage of movement and virtual reality immersion, with a view to *pun intended* transform a boring road trip for a passenger into an exciting space battle with the Avengers! Well, at least that’s the demo that was available to willing journalists and participants. It’s an incredibly interesting concept, the VR experience adapts to the movements of the car, when the car goes around a tight corner, your VR spacecraft slingshots round an enemy craft, when the car brakes, so does your spacecraft. The main problem of VR in its current state is movement. In more traditional games the player is either required to use a controller to navigate the game world, or to have a dedicated real-world space in which the player walks around. The third type of experience is known as on-rails, which, as the name suggests, is like being on a rollercoaster ride, allowing the experience to happen around you. The problem is, your head feels like you’re moving, but your gut knows you’re not, and while this isn’t the case for everyone, results in a bad time for a fair few. This is where Holoride makes sense, it’s implementing the on-rails experience while providing the motion as well, does it have the potential to be the VR sweet spot? Audi have tested the tech for motion sickness and after 30-minute drives, passengers were asked how they felt, and the reports were good. The experience is cleverly synced with Audi’s navigation system, allowing the runtime of the experience to be tailored to the length of the journey. The way this technology could be implemented is exciting, imagine a ghost tour around York, with added ghosts, or riding in convoy with Mad Max on your trip down south. 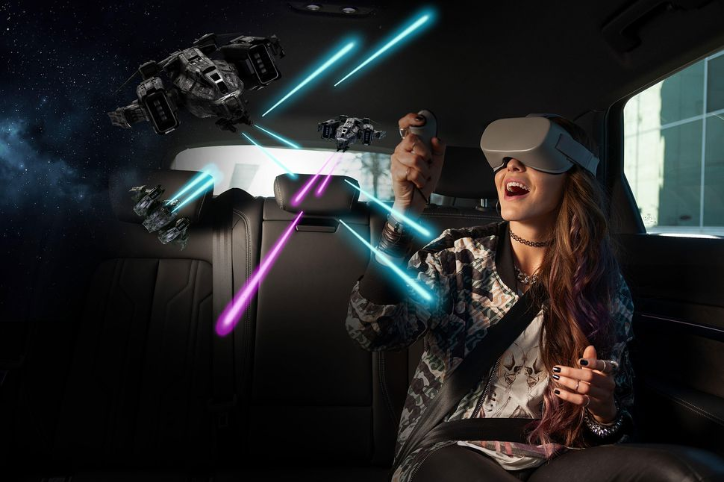 In summary, it looks to be a harmonious partnership of VR and driving, set to eradicate those long, mundane passenger journeys into out of this world adventures. Of course, only time will tell whether this becomes a reality or not, it’s still early days of production, with this CES being the first time anyone outside of Audi and Disney have had a hands-on with Holoride.